As you may know, Lawrence is hosting a TEDx event this May, Re-imagining the Liberal Education. It looks like we are going to have to update our speaker list, as Bradley W. Bateman has been named President of Randolph College. (Now) President Bateman was on campus last year as part of our Senior Experience, discussing his book Capitalist Revolutionary. We have found a home for Econ 391, and it is in Steitz 230. We will see you over there at 3:25 on Thursday. 1. What is the thesis of the book? 2.What does “the great stagnation” mean? What is stagnating? “Great” compared to what? Is the title a play on another “Great” episode do you suppose? 3. How is “stagnation” measured? Do you buy this means of measurement? 4. What does Cowen suggest is the cause of the great stagnation? How does he support his case? Can you think of alternate explanations? 5. What is Cowen’s remedy for the great stagnation, if any? Does it suggest a pro-market, get-out-of-the-way response? A more muscular federal policy response? New institutions? What? 6. Make a list of Cowen’s arguments that you buy and arguments that you don’t buy. This week, we take on the “companion piece” from The American Interest, “The Inequality that Matters.” It’s hard to think about the future of capitalism without thinking a bit about what inequality is and why it is (and isn’t) important. It seems an opportune time to point to the Financial Times’ recent in-depth debate, Capitalism in Crisis. There is some excellent material in there, and we will take a look at some of this when we get to the Backhouse and Bateman book. The Economics Department once again proudly announces its community read for the term. The formal title of the course is DS 391 – Keynes, Cowen & Capitalism, and sign up sheets are tacked to my bullitin board. You can get instructor approval from either Professor Galambos or me (or both!). We will see about arranging a time. Roger Backhouse and Brad Bateman’s Capitalist Revolutionary: John Maynard Keynes. Tyler Cowen The Great Stagnation: How America Ate All the Low-Hanging Fruit of Modern History, Got Sick, and Will(Eventually) Feel Better . Tyler Cowen “The Inequality that Matters,” from The American Interest online. Erik Brynjolfsson and Andrew McAfee, Race Against the Machine: How the Digital Revolution is Accelerating Innovation, Driving Productivity, and Irreversibly Transforming Employment and the Economy. The Backhouse and Bateman book is a quick read, and Professor Bateman is tentatively scheduled to visit as part of our Senior Experience. Backhouse and Bateman have promoted their work with pieces in the the New York Times and more recently in The Guardian. Tyler Cowen’s little ebook also talks about some of the problems and prospects of American capitalism, and should be interesting to set side-by-side with the Keynesian worldview. As a bonus, the book has been heavily reviewed, and there is certainly no consensus view on whether he is right or wrong. There have been a couple of recent reviews juxtaposing Cowen with Brynjolfsson and McAfee. We should be able to do the same. One of the key issues of capitalism moving forward seems to be the division of the proverbial pie, and Cowen’s piece in The American Interest is one of the more thoughtful pieces on inequality that I have come across. I especially like the “betting against the Wizards” example of picking up pennies in front of the steamroller. Once we have our enrollment, I will coordinate a schedule. Students (and faculty) are required to read and respond thoughtfully. We have been sponsoring a reading group (DS-391) in the economics department over the past four terms, and we will continue that with two books during the winter term. If you have some spare time in the next five weeks, you might try getting a jump on these. 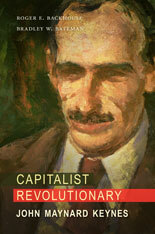 The first is Roger Backhouse and Brad Bateman’s Capitalist Revolutionary: John Maynard Keynes. The authors’ names might sound familiar from a couple of posts ago where I briefly discuss their op-ed in the New York Times about the need for economist as “worldly philosopher” rather than “dentists” (Keynes’ term) honing in on the intricacies of the little picture. Indeed, the book portrays Keynes both as a deep thinker and an accomplished technical theorist. The second is Tyler Cowen’s brief yet epic e-book, The Great Stagnation: How America Ate All The Low-Hanging Fruit of Modern History, Got Sick, and Will (Eventually) Feel Better. This is one of the most thoroughly reviewed pieces I have ever seen, with scholars and bloggers and otherwise lining up to weigh in. There is plenty to talk about with this one. Both books should be accessible to economics students at any level.